Peru is a fertile land for the Gospel of Jesus. Rev. Joel Savage, as head of Savage Ministries, is meeting the challenge of sharing the gospel with the souls living in Peru. Joel and his wife Maria have begun a school in Victor Raul, a poor suburb of Trujillo the second largest city in Peru. The goal of this school is to provide Christian based education for impoverished children who have little hope of advancement apart from the education provided by this school. Construction is almost completed, and we are currently seeking sponsors for the children so the school can be offered to the community at no charge. This sponsorship will also provide each child with a hot lunch and a snack five days a week. For many children this will double the meals they eat daily. Sponsorship is only $25.00 per child per month. Joel and Maria also head an evangelist outreach ministry to share Christ's love to poor children and youth through dramas, dances, games and an invitation to surrender their lives to Jesus. Last year over 4,500 adults accepted Jesus along with 7,000 children. This year our first outreach will be in a stadium and we are expecting over 5,000 souls to attend. The ministry also works with Samaritan Purse and gives out shoe boxes in April. Many souls come to the Lord through this effort. Joel and Maria also hold weekly youth meeting as well as preaching in various churches monthly. Joel has been invited to minister at some of the largest youth conferences in Peru. 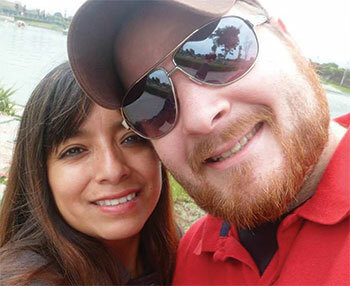 This year Joel and Maria hope to plant a church in Trujillo. Joel is 29 years old and travels with Savage Ministries and has ministered in numerous churches. He has a heart for missions and evangelism. While attending Victory Christian School, he went on yearly mission trips where he saw many miracles and helped lead numerous young people to the saving knowledge of Jesus Christ. Joel is currently a missionary in Peru and helps lead and oversees the mission work the ministry is doing there. He attended Oral Roberts University where he majored in Marketing and Public Relations. María García Ramos Savage, 31 años de edad peruana residente en la cuidad de Trujillo- Perú, nacida en familia pastoral ;desde niña lleva ministrando a través de la alabanza en cruzadas, campañas, congresos ,ah ganado festivales de canto en su país ,ama a los niños ejerce el ministerio de niños desde la edad de 14 años , donde ah visto las maravillas de Dios en su vida y la de muchos niños con maltrato psicológico y maltrato sexual , a través del ministerio de samaritan's purse ah ido realizando un trabajo de misiones por el norte del Perú viajando por muchos lugares de extrema pobreza de su país llevando la palabra de Dios a los niños, en la actualidad pertenece al ministerio de música de su iglesia , desempeñando también un trabajo eficaz en el ministerio de niños y de jóvenes ,lleva la carrera de turismo y actualmente trabaja en Savage Ministres.